Research proves B2B marketers are making major mistakes with their content-based demand generation strategy. Robert Alvin, CEO and Founder of NetLine Corporation shares some new insights and research to show how marketers can optimize their content. *Post originally appeared on MarTech Advisor. Show of hands, what marketers made tactical changes to their demand generation strategy this year based upon external survey reports? Better yet, what marketers carried forward with the same strategy from last year? It’s become clear that the majority of B2B marketers do not have access to the scale and level of data they need to make educated decisions about their content-based demand generation strategies. In my experience, working with hundreds of marketers from the world’s largest organizations to startups, B2B marketers everywhere struggle to understand market realties as they relate to their ideals and their organization’s goals. Whether marketers are being naïve or just not motivated to change course, they are making a mistake. Today, performance goals are creeping into every facet of marketing. No campaign goes out the door without a clear understanding of how it will affect my marketing team’s lead-based and revenue-based goals. Marketers are being held accountable for their ability to impact pipeline development today more than ever; which is why it makes no sense when I see marketers making the same mistakes with their content, from content creation and campaign targeting, to lead nurturing programs. Marketers are going to generate poor results if they continue to make these glaring mistakes with their content-based demand strategy. 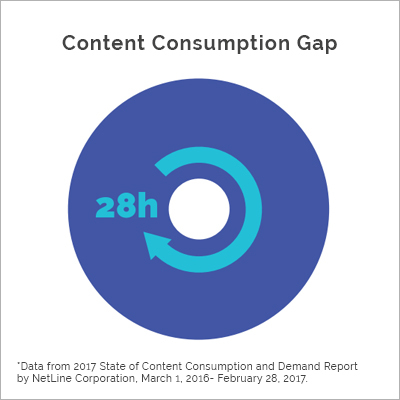 Rather than letting this landslide continue, NetLine conducted research analyzing real data, real activity, real human behavior as it relates to long-form content consumption to give marketers exactly the kind of actionable data they need to run more successful lead generation initiatives. 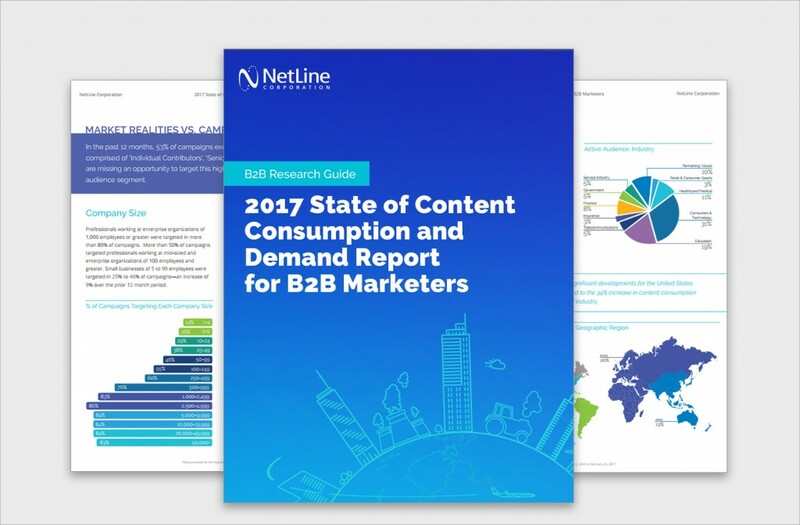 We analyzed 8.5 million leads generated by professionals requesting to download content (white papers, reports, eBooks, etc…) across NetLine’s B2B content syndication lead generation network in the past 12 months and isolated insights for B2B marketers in the 2017 Content Consumption and Demand Report. I want to be clear why this is of importance; the research is based upon real activity and behavior, this is not a self-serving survey of marketers answering questions about what they are doing—and that is an important distinction. In addition to examining the content consumption trends of professionals, we also layered in the competitive side by breaking down the campaign lead filters marketers are using to reach their target personas. Actual active audience data versus in-demand personas, this is where the magic happens. Before we dig into the big insights, I will confirm for the questioning marketers out there that long-form content is a rapidly growing solution for both professionals and marketers. 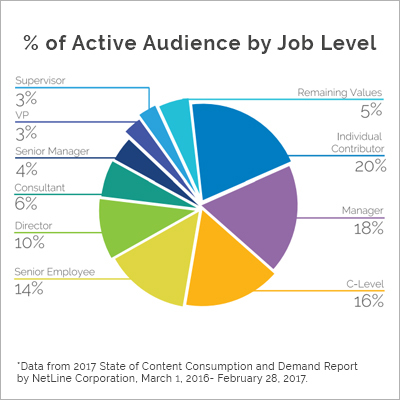 In the past 12 months, the volume of content consumed by professionals across the NetLine network increased by 36%; over half of the professionals consumed more than one piece of content, and 20% consumed more than 5 pieces of content. Professionals are reporting a growing demand for long-form content and marketers need to capitalize on this. So now let’s take a look at the glaring problems, or ‘opportunities,’ marketers have to improve their content strategy and drive more meaningful results this year. While the entire competitive landscape is seeding the market with ToFu content, take this opportunity to offer supplemental content that speaks to the needs of professionals focused on more decision oriented topics. Implement a balanced content strategy with resources for all stages of the buyer’s journey. Now, if you follow this recommendation you also need to pivot the campaign targeting for each piece of content to specifically reach professionals known to be aligned with in-market and intent-driven positions. Doing so will allow marketers to translate anonymous personas into further down the funnel prospects. That’s a perfect lead into my next insight, campaign targeting. In the past year, 53% of campaigns applied lead filters that excluded 30% of professionals actively researching business-related topics. The most commonly rejected professionals were ‘Individual Contributors,’ ‘Senior Employees,’ and ‘Consultants.’ Interesting fact about these professionals, ‘Individual Contributors’ consumed the highest volume of content over any other job level, and that volume increased by 26% over the prior year. The consumption activity from ‘Consultants,’ a smaller audience segment, increased by 49%. Huge stats from these professionals! Have you stopped to consider that these mid-level professionals could be key influencers within an organization? Sure, senior leadership will remain an important target for lead generation campaigns; however, marketers must realize they do not drive the same level of content consumption activity. Pivot focus to the influencers, the diverse profile of professionals within the buying committee, including Managers, Senior Employees, and Individual Contributors—as well as Contractors and Consultants. As a CEO, I can personally tell you that while the largest business purchase decisions may occur at C-level (pun intended), the research and recommendations come from below. It takes a village and the head of the village doesn’t have the time to do all the research. Build deeper influence within the organization by expanding your target range outside senior leadership and target the professionals that advise them. 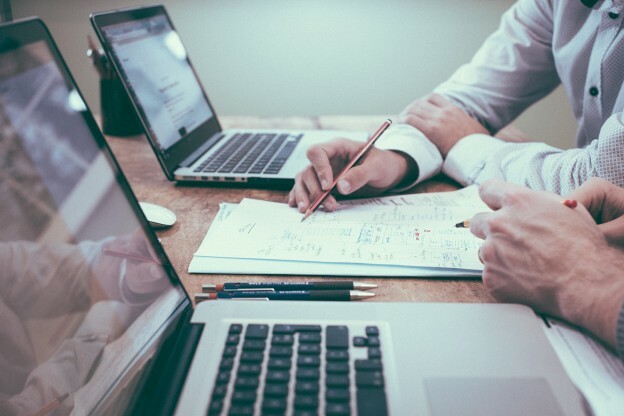 Deeper influence within the organization will directly build greater credibility, an often underestimated attribute associated to the vendor selection process. Finally, lead nurturing. If you are going to operate a sound strategy to drive pipeline development, lead nurture is a critical element. In our research, we found that the average timespan between the moment a person requests your content and the moment your content is opened by the person (the Content Consumption Gap) averaged 28 hours. Now think about that for a moment in relation to your lead follow-up practices. Do you have rules in place for nurture automation or Sale’s follow-up? If so, when do they start? Chances are you are following up to a long-form content request the exact same way you would for an online demo request, immediately. Wrong, wrong, wrong! If the average professional is not even opening your content for more than one day, how will they be ready to have an educated conversation with you? They won’t. And they will most likely be irritated by your gesture. Unless the touchpoint is used as a light check-in to assure the person you’re available when they’re ready to dig in. Nurturing a new lead is just as important as generating a net-new lead; therefore, NetLine’s recommendation is to allow for at least 2 days prior to lead follow-up on long-form content consumption in order to ensure effective conversations with prospects. Making the mistake of immediate contact will waste your team’s time and possibly alarm the prospect. 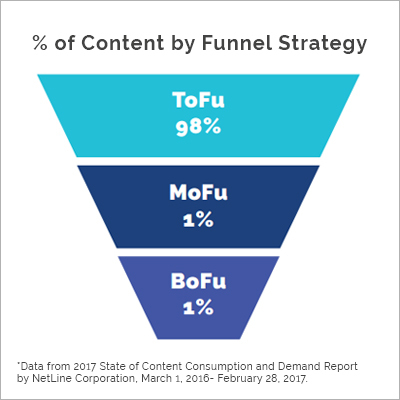 Do me a favor, if you gain nothing else from these insights, please hear this—use real data to drive your demand generation strategy; whether it’s NetLine’s research, your own, or another third party MarTech solution. The insights and tactical recommendations I have laid out here are not difficult and will have a massive impact on your ability to meet, if not exceed, your performance goals this year.